Have you ever wondered if your car mechanic is charging you too much? Or been worried about taking your laptop to a computer specialist, because that might cost you almost as much as a new computer? Have you ever suspected that your taxi is driving you in circles when you were visiting a tourist destination? For most people the answer to at least one of those questions is a loud “yes”! So, what is it that makes us consumers so vulnerable in these – and other – kinds of situations? The answer is straightforward: it’s all about information. The above are all examples of so called credence goods markets: the seller has superior information, in other words she knows more than the consumer about the good or service that the latter needs. For instance, when a car mechanic tells me that my brakes need to be replaced, I tend to believe them – who wants to take the risk of driving without functional brakes? To make things worse, consumers are frequently not even ex post able to observe the quality that they have received. Did my mechanic really replace those brakes with new ones? To sum up the problem, we often have to rely on the judgment of an expert who is also the seller of a good or service, and this opens the door to fraud. Taxi rides are no different. In an unfamiliar city, the passenger often has no clue (or only a vague idea) about the shortest route to a destination. So it’s in the driver’s interest to increase the fare by taking a longer route. 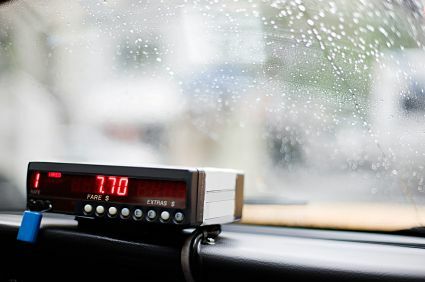 Or, even worse: some drivers charge higher fares than they should, by means of manipulated taximeters or other methods. Most of us have experienced such events, or at least heard of others who have. For instance, I have recently seen news reports on taxi fraud in New York City, Berlin, or a number of other cities such as Prague or Buenos Aires – see the exciting new documentary series on city scams in the National Geographic channel. This is where our study comes in. Anecdotal stories abound, but our aim was to undertake a systematic investigation into fraud on a real credence good market by means of a field experiment. Our pick was the market for taxi services in Athens, Greece. Five undercover experimenters took 348 taxi rides on 16 different routes throughout the city and, rotating in groups of three, assumed different “information roles”: in the role of a local native passenger, the experimenter entered a taxi and simply asked to be taken to a given destination. In the role of a non-local native passenger, the experimenter would add that he is not familiar with the city and ask if the driver knew the destination. This is a clear signal that the passenger has inferior information, allowing the driver to infer that he can get away with taking a circuitous route to the destination – we refer to this type of fraud as overtreatment. In a third role, that of a foreigner, a passenger would repeat the “non-local” scenario, but in English. This is then a clear indication that the passenger is not only unfamiliar with the city’s roads, but also with the taxi fare system, which is regulated nationwide in Greece! This opens the door to an additional type of fraud through manipulated bills, bogus surcharges and the like. We call this overcharging, because it means that an excessive fare is charged for a given distance. What did we find? Well, first of all, it’s not a good idea to let the driver know that you don’t know your way about – unless you enjoy being taken for a ride! Our local passengers were hardly ever taken on detours, while the other two roles (non-Athenian Greeks and foreigners) were taken on detours of about double length on average. On top of this, passengers acting as foreigners fell victims to overcharging much more often than native passengers, who presumably know how fares work in the country: about every fifth foreigner ended up paying more than they should for a given ride, while the frequency was around 5% for the other two types of passengers. Hence, we detected a very systematic pattern of fraud, relating to a passenger’s perceived information. In addition to the information dimension we manipulated the passengers’ perceived income in our experiment, alternating their appearance and exact destination and thereby distinguishing between those with high and low perceived income. We did not find strong evidence for an effect of income on fraud, although “rich” passengers did appear to be somewhat more susceptible to detours. The good news is that, notwithstanding the systematic nature of fraudulent behavior, its occurrence is relatively infrequent in Athens. Indeed, the majority of taxi drivers in our sample provided an honest service and charged the correct amount for it. We can draw some specific lessons from these findings. The obvious implication is that a buyer should convey, if possible, the impression that they are not clueless. For instance, in the case of medical treatments – another prominent credence good – it may be worthwhile mentioning a (fictitious) doctor in the family; or, with car repairs, memorizing and using some technical terms might help, and asking the mechanic to put the replaced parts back in the car’s boot can guard against false charges. For taxi rides, one possibility is to use navigation systems (available in many mobile phones) to verify the optimal route to a destination. In a nutshell, as in many other economic situations, information is the key. Loukas Balafoutas is Assistant Professor in the Department of Public Finance at the University of Innsbruck. He holds a Ph.D. in Economics from the University of Edinburgh and has also worked at the OECD Development Centre. His research focuses on the behavioral underpinnings of economic activity and he has used laboratory and field experiments to study behavior in areas such as tournaments, public goods, property rights, corruption, and social norms. He is the co-author, along with Adrian Beck, Rudolf Kerschbamer, and Matthias Sutter, of the paper ‘What drives taxi drivers? 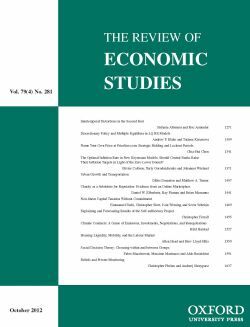 A field experiment on fraud in a market for credence goods’ in full and for free in The Review of Economic Studies. Image credit: Taxi. By Oktay Ortakcioglu, iStockPhoto.